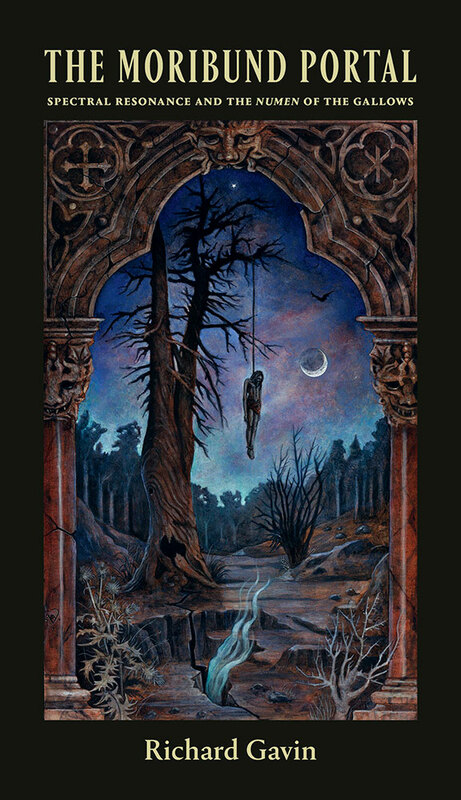 Bearing the impressively arcane subtitle “Spectral Resonance and the Numen of the Gallows,” Richard Gavin’s The Moribund Portal is a meditation on the symbolism of the gallows, and its place in folklore, spiritism and occult philosophy. From the opening paragraph, The Moribund Portal reads like what you would expect from a Three Hands Press title, and certainly moreso than another recent release. This involves, if we dare coin the phrase, a Schulkian type of sentence structure, gloriously beginning the proceedings with “Sites of archaic tragedy, iniquity, or turmoil can server the living as stations of unique spirit function.” Yes, indeed. 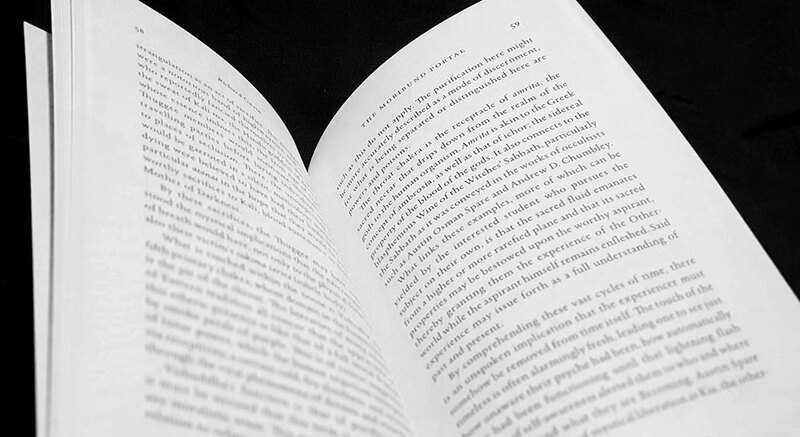 Running to just 90 or so pages and undivided by chapters, save for a clearly defined epilogue, or even subheadings, The Moribund Portal feels more like an extended essay than a true book. It is, indeed, what the title says, a portal that is formed by the image of the gallows, but which uses this morbid focus as a means of moribund egress to explore a variety of related themes. Untethered by the structure and clear signposts provided by subheadings, there’s a feeling of the thematic focus swinging, like a gibbet hanging from a gallows tree, as topics move from one to the other. Thus, the occupant of the gallows proves an apt leaping off point, if you’ll pardon the allusion, leading to discussions of the hand of glory, mandrake, dreams, while touching variously on Cain, Germanic mysticism, tantra, and perhaps most intriguingly, given its uniqueness, Canadian folklore. Gavin uses two examples from the latter as rather significant talking points: a tale of an enigmatic hanging from York (now Toronto) and the Québécois folk legend of la Corriveau. Despite its length, The Moribund Portal is not necessarily a brisk read, due to Gavin’s style of writing. He writes with a considered, grandiloquent and formal delivery, but does so expertly, without falling into the traps that lesser authors do when ambition outstrips ability. Instead, Gavin’s presents a masterclass in how to write 21st century occult style, combining academic phrasing, sophisticated occult terminology (your ‘numens’ and ‘sodalities’ but alas, no ‘praxis’) and just the right sprinklings of archaism. Never overdoing any of these elements, and thereby disappearing into black holes of meaningless, it’s all tied together with perfect punctuation. Writing in such a deliberate way is often, I find, its own form of proofing, as the careful concatenation of words requires constant revision. For this reason, or not, there’s little to complain about here with spelling and punctuation, especially compared to other recently reviewed titles; with only one noticeable spelling mistake really jumping out. The result is a read that feels sophisticated and knowledgeable, rather than someone trying their damnedest to sound erudite or attempting to use a lexicon not naturally their own (you know, most occult authors). The Moribund Portal features a stunning image by Benjamin A. Vierling as the cover, while the typesetting is by Joseph Uccello, both Three Hands Press stalwarts. Like the portal of the title which is reflected in the framing design on the cover, The Moribund Portal is an atypical 9.5 x 6 x 1.5 inches, with its narrow dimensions making it fit easily in one hand when closed. This smaller width does make the binding a little tight, especially given its sub-100 page length, so it’s one of those volume where a little more effort than usual is needed to turn the pages and hold them open, leading to fatigue and the occasional shaking of hands to dissipate the ache. Orryelle Defenestrate-Bascule has already had one review this year here at Scriptus Recensera with Time, Fate and Spider Magic from Avalonia. While that work was largely a written one with elements of Orryelle’s art featured throughout, Distillatio is very much a complete showcase of their visual output in various mediums. As its name suggests, Distillatio represents said alchemical stage, and acts as a companion to the other parts of the process documented in Orryelle’s Tela Quadrivum series: Cojunctio, Coagula and Solve. 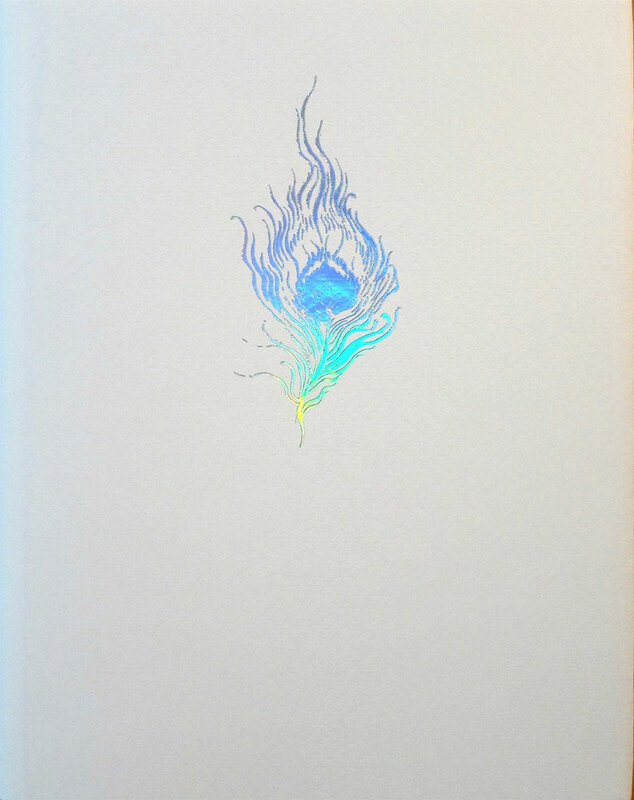 The status of Distillatio as the final volume in this series and the culmination of the alchemical process is reflected in the design, with the book bound in a pure white cloth and wrapped in a weighty white dust jacket with the Cauda Pavonis or Peacock’s Tail in iridescent foil on the front and a similarly rendered fingerprint design on the back. While the previous entries in the Tela Quadrivum series worked predominantly in black and white, with flecks of gold and silver, Distillatio takes the opportunity provided by the iridescence associated with its alchemical stage and runs with it. Colours, and in particular striking Melek Tausian-blues and a rich ruddy brown, dominate, with the book showcasing Orryelle’s ability as a painter in oils. Orryelle’s characteristic fleshy forms are given an added layer of depth and voluptuousness with the addition of oils, bringing with it a different sense of energy. Like many of the line-drawn figures in occult art, Orryelle’s phantasmagorical forms usually have an ephemeral and chimerical feel, adrift in a timeless netherworld, but with the addition of oils, they become a lot more present, the line made flesh as it were. With this physicality comes two things, energy and permanence. 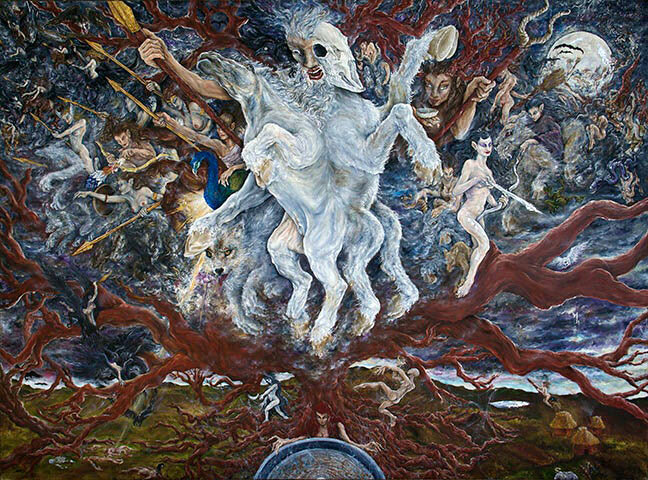 In The Wild Hunt, participants in the Heljagd pour forth from the centre of the image, reaching across a tumultuous heaven in a furious motion that is mirrored below by the reaching branches of the World Tree. Their source at the centre, which in this case is the gutter of the two page spread, is a zoomorphic figure of Odin and Sleipnir interfused, disappearing into the liminal space created by the formatting of the book. Naturally evocative of Peter Nicolai Arbo’s Asgårdsreien painting from 1872, The Wild Hunt replaces Arbo’s classical forms with more tangible yet still fleetingly elven figures, whose ferocious, otherworldly speed is implicit within the flurry of brush strokes. 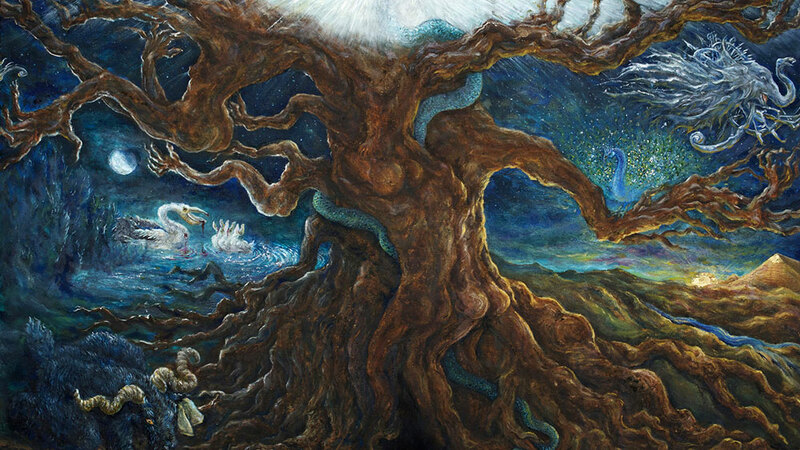 The World Tree of the The Wild Hunt is a frequent motif within Distillatio, often assuming the same compositionally-central role, with its branches and roots emanating outwards, bringing with it various forms of life. In one, alchemical birds appear in its branches and surrounds: a bloody-breasted pelican feeding its young, a resplendent white eagle that forms the tree’s crown and is mirrored by the shadow of a black eagle in its root, while a peacock claims a branch as its own. Similarly in Cycle of Life, the tree sits at the centre of the only partially coloured and inked image, some of its limb anthropomorphised into grasping hands, while various animals and humanoid creatures emanate from it and circle around the frame as embodiments of Nature, red in tooth and claw. 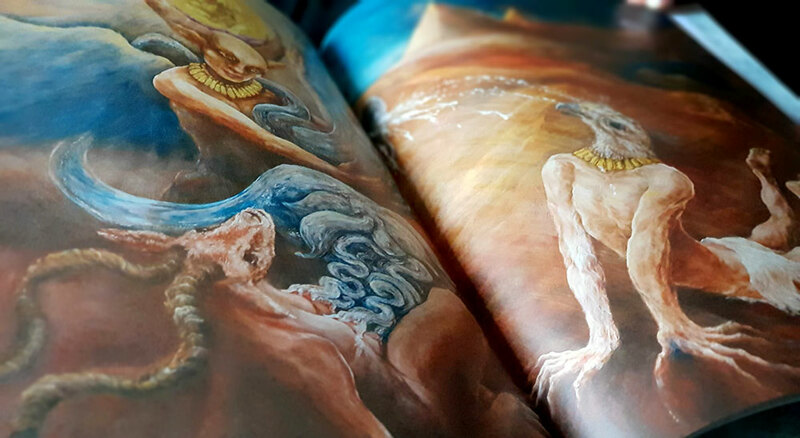 In more static images, Orryelle’s oil paint gives gravity and a luminous power to its subjects, such as the looming figure of Isis in Osiris Embalmed, or the apple-clasping Melek Taus adrift in a sea of peacock feathers and interstellar clouds in Melek Taus and the Path of Venus. Meanwhile, in With the Milk of a Gazelle, Hathor heals Hoor’s Eyes, an asomatous Egyptian landscape hosts Hathor, crowned effulgent, who heals the eyes of a contorted Horus that lies before her, his arms and legs twisted into uncomfortable reversal. As evidenced by the variety of deities featured throughout the works, Distillatio is indicative of Orryelle’s eclectic mythological tastes, with the various divine stars being familiar to anyone who has encountered hir work before. This syncretic quality draws principally on Egyptian, Hindu and Germanic myth, with bits of Greek and Celtic thrown in, sometimes in the same image. It isn’t only oil paintings that feature in Distillatio and Orryelle also includes a selection of his digital montages. Some of these incorporate elements of his paintings, such as St Michael And/As The Beast which blends the background of a painting with repeating photographic images of Orryelle as the titular and winged saint. There is something a little incongruous about the presence of these montages, and the incredible skill evident in the paintings is not necessarily always matched in their digital siblings. It feels like the book would have been no poorer had they been left out, allowing for the paintings alone to be a more solid and consistent body of work. Explanations for the images are spread periodically throughout the book, appearing in explanatory blocks before or after several blocks of spreads. It’s not the most satisfactory way of presenting this information, requiring a lot of flicking backwards or forwards, but there’s not many other ways to do it. These legends to the legends are fairly pithy and provide an invaluable aid to understanding Orryelle’s multi-layered images. It is a shame the typography used here does not mirror the beauty of the images, with it all feeling very defaulty due to the body being set in generic Times, save for Orryelle’s typographically-inadvisable tendency to use a goody bag of other typefaces to highlight certain words. Subheadings are also subject to this, centered atop each section and appearing variously in Harrington, Stonehenge and the face that shall not be named; well, OK, suffice to say, I was not best pleased to see the Egyptian-related subtitles being in dreaded, stroke-bolded Papyrus. Distillatio was made available in standard and deluxe editions, with the standard being 640 hand-numbered copies in white cloth with a white dust-jacket. The deluxe edition of 64 hand-numbered copies signed by the artist came in crushed white quarter morocco, stamped in black with top edge silver in a dust-jacket and slipcase. 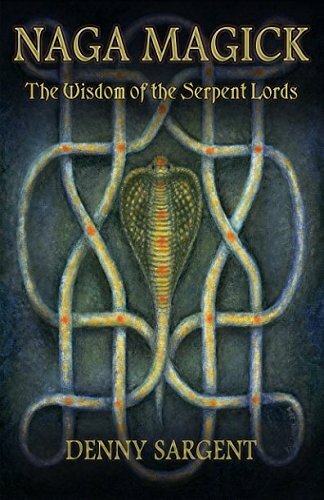 Naga Magick: The Wisdom of the Serpent Lords by Denny Sargent gets points right out of the gate for being a first as far as the theme goes. Rather than dealing with roads more travelled and their familiar pantheons, Sargent has focused on the nagas, the serpentine race of beings found in Hindu and Buddhist traditions. For contrarians and eternal rebels such as this reviewer, there’s a certain charm to this, highlighting, as it does, the cool and unknown, the adversarial and misunderstood, the allure of the darkly glamorous. The naga are largely defined by Sargent in this manner. They are beings who seem to predate the more familiar pantheons of the Indian subcontinent, sitting in a twilight world between asuras and suras, comparable to the fey folk of Western Europe or the Orishas of Santeria. As serpent beings, the naga have associations with water and the underworld, with wisdom, healing and fertility, making them a perfect fit for those with ophidian predilections. Naga Magick is divided into two sections: theory and praxis. In the first, and briefer, of the two Sargent gives an overview of what little is known about the naga. In a manner he himself describes as rambling, Sargent presents the naga as figures who are more familiar from folk tradition and legend, rather than grand myth. They are not necessarily the dark serpentine creatures one might expect to find within some of the more kvlt and grim areas of the occult milieu, having more of those folk characteristics that means they are to be warily respected and petitioned like the fickle fey folk of Europe. Sargent uses the nagas to create a model of a magickal universe in which there are four Naga Dikpala, guardians of the four directions (Utarmansa Naga, Bindusara Naga, Madaka Naga, Elapatra Naga, Mahanaga), along with eight further naga lords (Anata Naga, Takshaka Naga, Vasuki Naga, Padmaka Naga, Kulika Naga, Karkotaka Naga, Sankapala Naga and Mahapadma Naga). In addition, this system’s grounding in tantra enables naga cosmology to be integrated with the concept of the Red Goddess, Shri Kundalini, and she provides the centre, the point where the eight lords converge in the naga’s underworld realm of Bhogavati. This is the union of Naga and Nagi, of Shakti and Shiva, and her veiled appearances ensures that the Red Goddess, Lalita, Tvarita Devi, Tripurasundhari, has a pivotal role in the system presented by Sargent. When it comes to matters magickal, the central approach of the book is not a true reconstructionist one, as there doesn’t seem much to reconstruct. Sargent candidly acknowledges that there is not much that can be gleamed from historical sources in the way of naga traditions and rituals. Instead, his technique is to incorporate what little information there is into a framework that draws on established, often folk-based, traditions, with a modern Hermetic-Tantric flourish that is grounded in his experience with the Nath system of Shri Gurudev Mahendranath. Consequently, although this is by no means a Nath book, it feels as if that system inevitably informs much of what is presented here, with specific terminology, such as the euphonious ‘zonule,’ dropping in, sometimes a little incongruously here and there. Due to this use of familiar techniques, there is a certain, well, familiarity to the magickal methods presented here. From a recognisably western perspective, the four guardian nagas each have images and seals associated with them, as well as corresponding invocations to be used in concert. A more easterly approach is found with the use of mudra, pranayama, yoga and other tools of the Naga Sadhana. All techniques converge to varying degrees in the assortment of workings and spells, culminating in a grand Naga puja. This major ritual is intended for use during the great naga festival, or for any other significant work, and is based on a Nepalese rite recorded in Jean Philippe Vogel’s 1926 Indian Serpent-lore Or The Nagas in Hindu Legend and Art (something of a fortuitous source for Sergent). This is a length rite, taking 35 pages to effectively close the book in a procedure that invokes all twelve naga, Dikpala and lords, and ultimately Shri Kundalini, with some beautifully written liturgy. On the whole, what Sargent has presented here is a convincing, self-contained magickal system. It has a cosmology that, while not as fully fleshed out as something with a grand mythology available to it, makes the most of what information is available, and interprets it into a logical magickal paradigm. Sargent writes in something of a conversational tone, often pre-empting imagined questions from the reader, and speaking in a personal, informal manner. This helps assuage any quibbles one might have about the less than thorough or historically rigorous information in the book, with the evident caveats provided by his methods and motivations laid bare. While Sargent, one assumes, knows his stuff when it comes to matters naga and Hindu, there’s at least one moment where the information about other cultures is a little off. He refers to the World Serpent of Germanic mythology as Surtr, which, if one was to be charitable, could be a little known, but rather appealing, esoteric interpretation, but is more likely to be just a flub. This isn’t necessarily an errant naming not picked up in proofing, as the reference is made twice. As is always the unfortunate case in situations like these, it can somewhat undermine one’s overall confidence in the book.